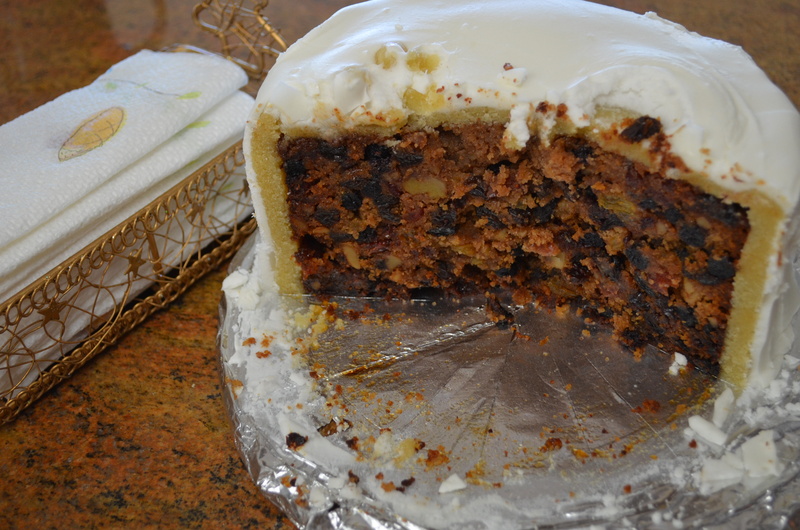 This is a pretty traditional rich fruit cake (lack of wheat, notwithstanding). Although the 6.5” tin looks as if the cake will be a bit small, by the time it has been covered with almond paste/marzipan and icing, it is big enough to serve 12-15 slices. I use a food processor to make mine as it’s easier to beat the eggs in, but you can do it by hand if you have a strong arm. I made an experimental version of this a few weeks ago (sans any almond paste and icing), and decided that was a good recipe because it disappeared within 24 hours …. and there’s only 4 of us in our household. In actual fact, this second one is even better (less crumbly in the middle), probably because I knew how long I wanted to cook it for without opening the oven periodically to stick the poor thing with cocktail sticks to check how it was doing. Rich Fruit Cake, minus the snowman and snowballs. Comfortingly traditional for Christmas. Grease a 6.5” round cake pan. Stir the dried fruit, nuts, and brandy together in a mixing bowl. Leave to soak, stirring occasionally. Cream together the margarine and sugar (in a small food processor, if you have one). Gradually beat in the eggs. Stir the flours and spices into the dried fruit. Stir the egg mixture into the fruit mixture. Mix well. The mixture should now have a soft dropping consistency. Adjust with a few tablespoons of cider or brandy, if necessary. Turn the mixture into the prepared cake tin. Bake at 300F for 2 hours. Check the cake is done by sticking a cocktail stick into the middle and withdrawing it. Check for uncooked dough on the stick. Allow the cake to get cold, before removing from the tin. Prick the base with a needle and spoon the brandy over the top, especially around the edges where it tends to dry out a bit. Eat as is, or cover with almond paste and icing.